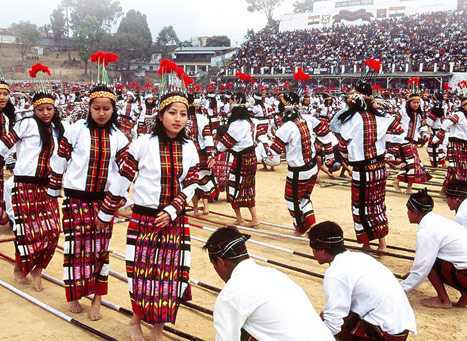 Kut festival or Chavang Kut is one of the most celebrated festivals of Manipur. Celebrated by the tribes of Kuki-Chin-Mizo groups of Manipur, Chavang Kut is a festival which is observed with so much zeal and joyousness. However, during the festival, the people of all communities of Manipur come together to commemorate this amazing fiesta. The festival is observed to mark the end of the harvesting season and also to thank deities for a good harvest season. Therefore, the festival is named Chavang Kut; Chavang stands for ‘autumn’ and Kut mean ‘harvest’. In the earlier days, the Kut festival used to last a number of days and many rituals were also used to perform. After the main rites, the village priest used to distribute ju(rice beer) to the locals. The celebration also included the dancing and singing along with the sports competitions and feasts. However, festival underwent a few changes after the influence of Christianity and cultures of outside worlds. Even after the fact that Kuki people have converted themselves into Christianity, the festival is still celebrated by them to commemorate a higher being for the bestowing a good harvest. However, in the present days, this beautiful Manipuri festival is celebrated on the first day of November month. During this time, the farmers gather their whole harvest and rejoice for the accomplishment of a good crop. One of the major attraction of this festival is the Miss Kut Beauty Pageant which also includes many performances from various artists, the pageant is organised on a large scale and is attended by various notable personalities of the state. The festival of Chavang Kut is celebrated on 1st November. The festival is celebrated to honour the blessings of the deity for a good harvest season. A beauty pageant competition is also organized during the festival. Folk dances and music are performed to celebrate the festival. During the festival, the farmers gather their crop altogether and show reverence to the gods to mark the end of the harvest season.